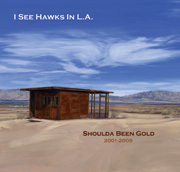 Lyrics for “Shoulda Been Gold” CD — I See Hawks in L.A.
Just ten stoney hours to my friend in L.A.
Change a stubborn old heart to see a better way? Run old Molly run . . .
And what are you in for now? Oh, what are you in for now ? I said come on down to L.A. Grab the kids, don’t wonder why . . .
What if this place got buried alive? Do you watch clouds disappear?